I was planning a meal for friends that we were having over recently when I came across this photo. That was all it took for my sweet tooth to take over. 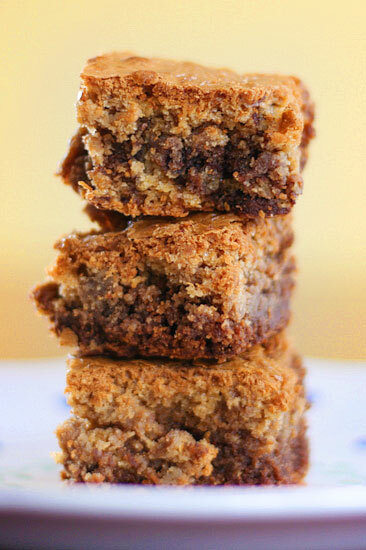 Since I just happened to have all of the ingredients to make these blondies, I added them to the menu. Besides, you can't neglect to serve dessert to your guests, right? The original recipe called for Nutella to swirl in the blondies, but I try not to keep it in the house to prevent myself from eating it from the jar with a spoon. Instead, I chose to add some chocolate chips because chocolate makes everything better! In the end, they were just a yummy as the photo led me to believe. Thankfully, there were mostly devoured, so I didn't have to worry about them sitting around and taunting me. Here is the recipe. Preheat oven to 350 degrees F. Grease an 8×8″ baking dish. Melt the butter in a medium saucepan over medium heat. Add both sugars and whisk to combine. Remove the mixture from the heat and set it aside to cool a little. In a large bowl, whisk together the eggs and vanilla extract until combined. Add in the butter and sugar slowly, while whisking constantly. Then add the flour and stir until just incorporated. Fold in the chocolate chips (or whatever goodies you'd like to add). Bake for 25-30 minutes or until the top cracks slightly and is firm to the touch. A toothpick inserted into the center will come out with moist pieces clinging to it. Remove to a wire rack and let cool completely or serve warm with a bit of ice cream! The original Nutella version of this recipe was found at Kevin & Amanda's Recipes, and there are lots of other yummy things to discover over there. 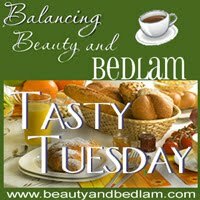 This post is linked to Tasty Tuesday at Balancing Beauty and Bedlam. Jen is talking about healthy eating choices which is a subject that is frequently on my mind despite my love of chocolate and blondies.